For the English psych band, see The Explosive. For the American band The Explosives, see Roky Erickson. Demonstration of the explosive properties of three different explosives. Each explosive is set on a solid marble base and is initiated by a glowing wooden stick. An explosive (or explosive material) is a reactive substance that contains a great amount of potential energy that can produce an explosion if released suddenly, usually accompanied by the production of light, heat, sound, and pressure. An explosive charge is a measured quantity of explosive material, which may be composed of a single ingredient or a combination of two or more. The distinction, however, is not razor-sharp. Certain materials—dusts, powders, gases, or volatile organic liquids—may be simply combustible or flammable under ordinary conditions, but become explosive in specific situations or forms, such as dispersed airborne clouds, or confinement or sudden release. At its root, the history of chemical explosives lies in the history of gunpowder. During the Tang Dynasty in the 9th century, Taoist Chinese alchemists were eagerly trying to find the elixir of immortality. In the process, they stumbled upon the explosive invention of gunpowder made from coal, saltpeter, and sulfur in 1044. Gunpowder was the first form of chemical explosives and by 1161, the Chinese were using explosives for the first time in warfare. The Chinese would incorporate explosives fired from bamboo or bronze tubes known as bamboo fire crackers. The Chinese also used inserted rats from inside the bamboo fire crackers to fire toward the enemy, creating great psychological ramifications—scaring enemy soldiers away and causing cavalry units to go wild. Though early thermal weapons, such as Greek fire, have existed since ancient times, the first widely used explosive in warfare and mining was black powder, invented in 9th century in China by Song Chinese alchemists. This material was sensitive to water, and it produced copious amounts of dark smoke. The first useful explosive stronger than black powder was nitroglycerin, developed in 1847. Since nitroglycerin is a liquid and highly unstable, it was replaced by nitrocellulose, trinitrotoluene (TNT) in 1863, smokeless powder, dynamite in 1867 and gelignite (the latter two being sophisticated stabilized preparations of nitroglycerin rather than chemical alternatives, both invented by Alfred Nobel). World War I saw the adoption of TNT in artillery shells. World War II saw an extensive use of new explosives (see List of explosives used during World War II). In turn, these have largely been replaced by more powerful explosives such as C-4 and PETN. However, C-4 and PETN react with metal and catch fire easily, yet unlike TNT, C-4 and PETN are waterproof and malleable. In Materials Science and Engineering, explosives are used in cladding (explosion welding). A thin plate of some material is placed atop a thick layer of a different material, both layers typically of metal. Atop the thin layer is placed an explosive. At one end of the layer of explosive, the explosion is initiated. The two metallic layers are forced together at high speed and with great force. The explosion spreads from the initiation site throughout the explosive. Ideally, this produces a metallurgical bond between the two layers. An explosive is classified as a low or high explosive according to its rate of combustion: low explosives burn rapidly (or deflagrate), while high explosives detonate. While these definitions are distinct, the problem of precisely measuring rapid decomposition makes practical classification of explosives difficult. The chemical decomposition of an explosive may take years, days, hours, or a fraction of a second. The slower processes of decomposition take place in storage and are of interest only from a stability standpoint. Of more interest are the other two rapid forms besides decomposition: deflagration and detonation. 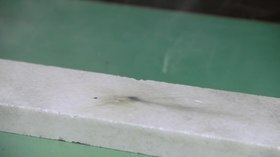 In deflagration, decomposition of the explosive material is propagated by a flame front which moves slowly through the explosive material at speeds less than the speed of sound within the substance (usually below 1000 m/s)  in contrast to detonation, which occurs at speeds greater than the speed of sound. Deflagration is a characteristic of low explosive material. This term is used to describe an explosive phenomenon whereby the decomposition is propagated by an explosive shock wave traversing the explosive material at speeds greater than the speed of sound within the substance. The shock front is capable of passing through the high explosive material at supersonic speeds, typically thousands of metres per second. Impact – Sensitivity is expressed in terms of the distance through which a standard weight must be dropped onto the material to cause it to explode. Friction – Sensitivity is expressed in terms of the amount of pressure applied to the material in order to create enough friction to cause a reaction. Heat – Sensitivity is expressed in terms of the temperature at which decomposition of the material occurs. Detonation pressure (Chapman–Jouguet condition). Detonation pressure data derived from measurements of shock waves transmitted into water by the detonation of cylindrical explosive charges of a standard size. Massive-diameter detonation velocity. Detonation velocity is dependent on loading density (c), charge diameter, and grain size. The hydrodynamic theory of detonation used in predicting explosive phenomena does not include the diameter of the charge, and therefore a detonation velocity, for a massive diameter. This procedure requires the firing of a series of charges of the same density and physical structure, but different diameters, and the extrapolation of the resulting detonation velocities to predict the detonation velocity of a charge of a massive diameter. The introduction of water into an explosive is highly undesirable since it reduces the sensitivity, strength, and velocity of detonation of the explosive. Hygroscopicity is a measure of a material's moisture-absorbing tendencies. Moisture affects explosives adversely by acting as an inert material that absorbs heat when vaporized, and by acting as a solvent medium that can cause undesired chemical reactions. Sensitivity, strength, and velocity of detonation are reduced by inert materials that reduce the continuity of the explosive mass. When the moisture content evaporates during detonation, cooling occurs, which reduces the temperature of reaction. Stability is also affected by the presence of moisture since moisture promotes decomposition of the explosive and, in addition, causes corrosion of the explosive's metal container. Explosives considerably differ from one another as to their behavior in the presence of water. Gelatin dynamites containing nitroglycerine have a degree of water resistance. Explosives based on ammonium nitrate have little or no water resistance as ammonium nitrate is highly soluble in water and is hygroscopic. 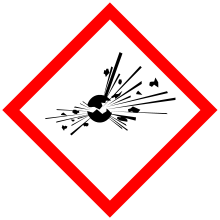 Many explosives are toxic to some extent. Manufacturing inputs can also be organic compounds or hazardous materials that require special handing due to risks (such as carcinogens). The decomposition products, residual solids, or gases of some explosives can be toxic, whereas others are harmless, such as carbon dioxide and water. Primary explosives are often used in detonators or to trigger larger charges of less sensitive secondary explosives. Primary explosives are commonly used in blasting caps and percussion caps to translate a physical shock signal. In other situations, different signals such as electrical or physical shock, or, in the case of laser detonation systems, light, are used to initiate an action, i.e., an explosion. A small quantity, usually milligrams, is sufficient to initiate a larger charge of explosive that is usually safer to handle. Most tertiaries include a fuel and an oxidizer. ANFO can be a tertiary explosive if its reaction rate is slow. Low explosives are normally employed as propellants. Included in this group are petroleum products such as propane and gasoline, gunpowder (including smokeless powder), and light pyrotechnics, such as flares and fireworks, but can replace high explosives in certain applications, see gas pressure blasting. Countless high-explosive compounds are chemically possible, but commercially and militarily important ones have included NG, TNT, TNX, RDX, HMX, PETN, TATB, and HNS. 1.1 Mass Detonation Hazard. With HC/D 1.1, it is expected that if one item in a container or pallet inadvertently detonates, the explosion will sympathetically detonate the surrounding items. The explosion could propagate to all or the majority of the items stored together, causing a mass detonation. There will also be fragments from the item's casing and/or structures in the blast area. 1.4 Moderate fire, no blast or fragment. HC/D 1.4 items are listed in the table as explosives with no significant hazard. Most small arms ammunition (including loaded weapons) and some pyrotechnic items fall into this category. If the energetic material in these items inadvertently initiates, most of the energy and fragments will be contained within the storage structure or the item containers themselves. The legality of possessing or using explosives varies by jurisdiction. Various countries around the world have enacted explosives law and require licenses to manufacture, distribute, store, use, possess explosives or ingredients. but it does not include an explosive substance produced as part of a manufacturing process which thereafter reprocesses it in order to produce a substance or preparation which is not an explosive substance"
"Anyone who wishes to acquire and or keep relevant explosives needs to contact their local police explosives liaison officer. All explosives are relevant explosives apart from those listed under Schedule 2 of Explosives Regulations 2014." New York: Health and safety regulations restrict the quantity of black powder a person may store and transport. ^ Sastri, M.N. (2004). Weapons of Mass Destruction. APH Publishing Corporation. p. 1. ISBN 978-81-7648-742-9. ^ Singh, Kirpal (2010). Chemistry in Daily Life. Prentice-Hall. p. 68. ISBN 978-81-203-4617-8. ^ Sigurðsson, Albert (17 January 2017). "China's explosive history of gunpowder and fireworks". GBTimes. Archived from the original on 1 December 2017. ^ Pomeranz, Ken; Wong, Bin. "China and Europe, 1500–2000 and Beyond: What is Modern?" (PDF). 2004: Columbia University Press. Archived (PDF) from the original on 13 December 2016. ^ Kerr, Gordon (2013). A Short History of China. No Exit Press. ISBN 978-1-84243-968-5. ^ Takacs, Sarolta Anna; Cline, Eric H. (2008). The Ancient World. Routledge. p. 544. ^ Back, Fiona (2011). Australian History Series: The ancient world. p. 55. ISBN 978-1-86397-826-2. ^ Ankony, Robert C., Lurps: A Ranger's Diary of Tet, Khe Sanh, A Shau, and Quang Tri, revised ed., Rowman & Littlefield Publishing Group, Lanham, MD (2009), p.73. ^ W.W. Porterfield, Inorganic Chemistry: A Unified Approach, 2nd ed., Academic Press, Inc., San Diego, pp. 479–480 (1993). ^ Krehl, Peter O.K. (24 September 2008). History of Shock Waves, Explosions and Impact: A Chronological and Biographical Reference. Springer Science & Business Media. p. 106. ISBN 978-3-540-30421-0. Archived from the original on 24 December 2017. ^ Krehl, Peter O.K. (2008). History of Shock Waves, Explosions and Impact: A Chronological and Biographical Reference. Springer Science & Business Media. p. 1970. ISBN 978-3-540-30421-0. ^ "Green explosive is a friend of the Earth". New Scientist. 27 March 2006. Archived from the original on 12 November 2014. Retrieved 12 November 2014. ^ a b Zel'dovich, Yakov; Kompaneets, A.S. (1960). Theory of Detonation. Academic Press. pp. 208–210. ^ Hougen, Olaf A.; Watson, Kenneth; Ragatz, Roland (1954). Chemical Process Principles. John Wiley & Sons. pp. 66–67. ^ Anderson, H.V. (1955). Chemical Calculations. McGraw-Hill. p. 206. ^ a b c Office, Government of Canada, Industry Canada, Office of the Deputy Minister, Canadian Intellectual Property (15 June 2015). "Canadian Patent Database / Base de données sur les brevets canadiens". brevets-patents.ic.gc.ca. Archived from the original on 18 October 2016. Retrieved 17 October 2016. ^ Meyer, Rudolf; Josef Köhler; Axel Homburg (2007). Explosives, 6th Ed. Wiley VCH. ISBN 978-3-527-31656-4. ^ Sam Barros. "PowerLabs Lead Picrate Synthesis". Archived from the original on 22 May 2016. ^ Cooper, Paul W. (1996). "Chapter 4: Use forms of explosives". Explosives Engineering. Wiley-VCH. pp. 51–66. ISBN 978-0-471-18636-6. ^ Table 12-4. – United Nations Organization Hazard Classes Archived 5 June 2010 at the Wayback Machine. Tpub.com. Retrieved on 2010-02-11. ^ "wetten.nl – Wet- en regelgeving – Wet explosieven voor civiel gebruik – BWBR0006803". Archived from the original on 25 December 2013. ^ "wetten.nl – Wet- en regelgeving – Wet wapens en munitie – BWBR0008804". Archived from the original on 25 December 2013. ^ a b "The Explosives Regulations 2014". www.legislation.gov.uk. Retrieved 16 February 2019. This article contains quotations from this source, which is available under the Open Government Licence v3.0. © Crown copyright. ^ "HSE Explosives - Licensing". www.hse.gov.uk. Retrieved 16 February 2019. ^ "1913–1919". Archived from the original on 1 February 2016. ^ "1940–1949". Archived from the original on 4 March 2016. ^ "1970–1979". Archived from the original on 17 November 2015. ^ "Federal Explosives Laws" (PDF). U.S. Department of Justice, Bureau of Alcohol, Tobacco, Firearms and Explosives. Archived (PDF) from the original on 6 March 2016. Retrieved 1 February 2016. ^ "ACASLogin". Archived from the original on 8 December 2014. ^ "Document – Folio Infobase". Archived from the original on 20 December 2014. Explosives and Demolitions FM 5-250; U.S. Department of the Army; 274 pp. ; 1992. Military Explosives TM 9-1300-214; U.S. Department of the Army; 355 pp. ; 1984. Explosives and Blasting Procedures Manual; U.S. Department of Interior; 128 pp. ; 1982. Safety and Performance Tests for Qualification of Explosives; Commander, Naval Ordnance Systems Command; NAVORD OD 44811. Washington, DC: GPO, 1972. Weapons Systems Fundamentals; Commander, Naval Ordnance Systems Command. NAVORD OP 3000, vol. 2, 1st rev. Washington, DC: GPO, 1971. Elements of Armament Engineering – Part One; Army Research Office. Washington, D.C.: U.S. Army Materiel Command, 1964. Safety in the Handling and Use of Explosives SLP 17; Institute of Makers of Explosives; 66 pp. ; 1932 / 1935 / 1940. History of the Explosives Industry in America; Institute of Makers of Explosives; 37 pp. ; 1927. Clearing Land of Stumps; Institute of Makers of Explosives; 92 pp. ; 1917. The Use of Explosives for Agricultural and Other Purposes; Institute of Makers of Explosives; 190 pp. ; 1917. The Use of Explosives in making Ditches; Institute of Makers of Explosives; 80 pp. ; 1917. Farmers' Hand Book of Explosives; duPont; 113 pp. ; 1920. A Short Account of Explosives; Arthur Marshall; 119 pp. ; 1917. Historical Papers on Modern Explosives; George MacDonald; 216 pp. ; 1912. The Rise and Progress of the British Explosives Industry; International Congress of Pure and Applied Chemistry; 450 pp. ; 1909. Explosives and their Power; M. Berthelot; 592 pp. ; 1892.